Menai Strait and its bridges. Menai Strait in Wales, and its bridges. The Menai Strait runs between the Welsh mainland and the island of Anglesey. This view, dating from the 1890s, looks from the 27-metre-high column bearing a statue of the Marquess of Anglesey, towards the island. 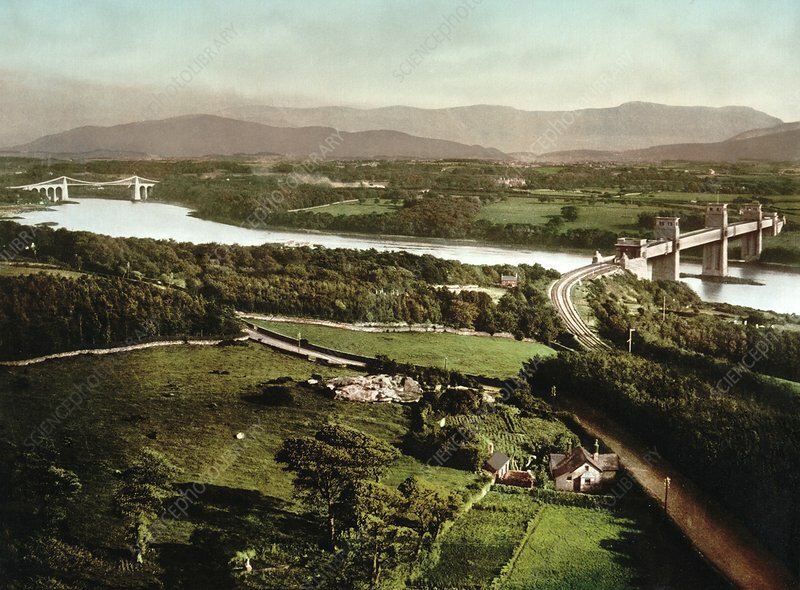 At left is the Menai Suspension Bridge (road bridge, 417 metres long, completed 1826). At right is the original Britannia Bridge (rail bridge, 461 metres long, opened 1850). Damaged by a fire in 1970, it was reopened for rail (1972) and rebuilt for road (1980). Photochroms are ink-based photolithographs.